Move to Scotland + empty nest = blogging about new discoveries...here in the Granite City of Aberdeen and beyond. 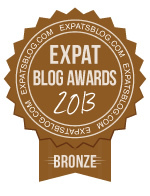 ExpatsBlog.com Expat Blog Awards 2013: Scotland Bronze Award! This blog won the Bronze Award for best expat blog in Scotland!